Happy first day of Spring! I'll be celebrating today with a field trip to a local science center with my class. I'm hoping that the weather holds out for us since it has been a bit rainy lately. Regardless, I am glad to officially be in a new season. I adore winter up until Christmas and a little bit into January but after that I am over it. Spring holds so much of what I love; fresh flowers, bright colors, and warmer weather. To make sure that I fully embrace this new season, I decided to make a bucket list. You can bet I'll be printing it out and hanging it on my bulletin board as a reminder to start checking some tasks off. I love sharing these on the blog and am already looking forward to making my next one for summer. I'd love to know what activities you think need to be added! And while this post is *mainly* about the bucket list, I couldn't help but want to include two of my favorite clothing pieces for spring. 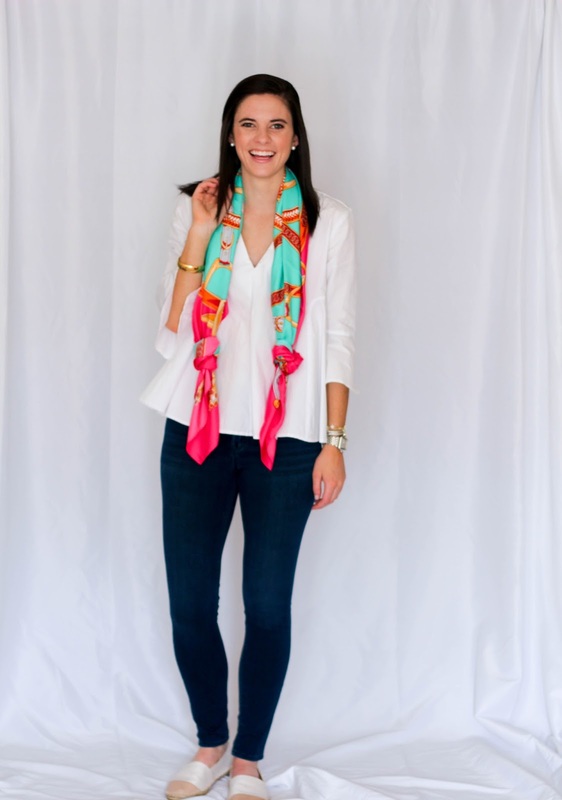 A crisp white blouse is hard to beat because of how easy it is to throw on and accessorize. This particular blouse falls into the category of loving it so much that I found it completely necessary to own it in more than one color. I've worn it to teach, to church, out to brunch, and even to run errands because of how effortlessly put together it looks. 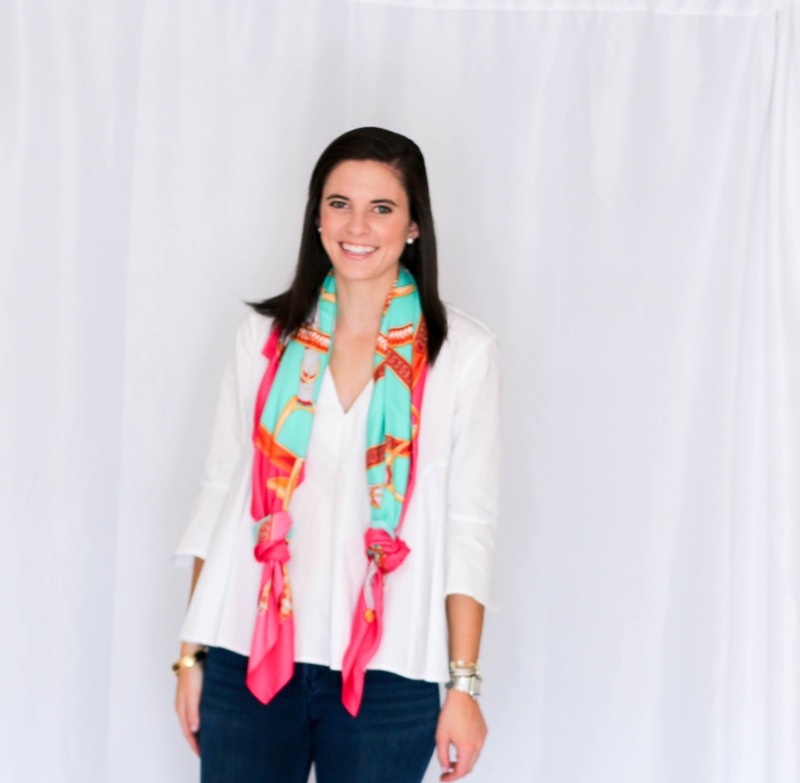 My newest favorite way to style it has been with this beautiful, under $50 scarf. 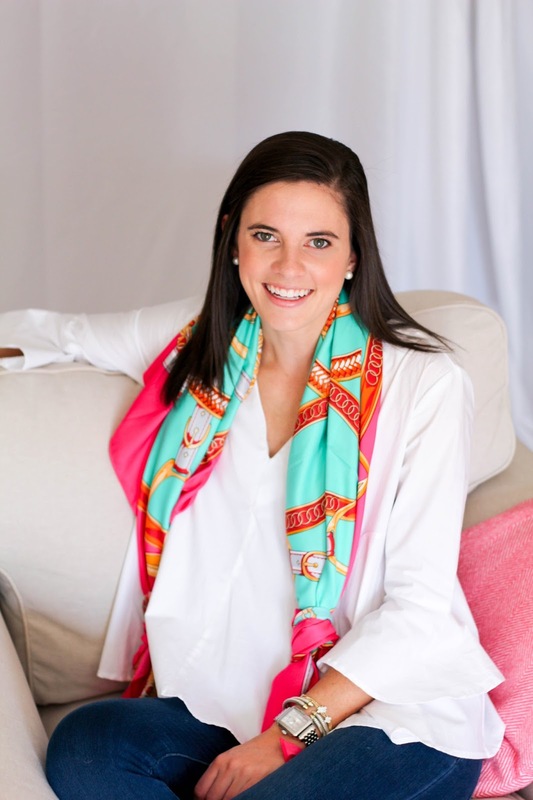 When I saw this scarf back in February I was shocked by the price as it looks similar to some pricier options out there. I usually am not one to order something if it is backordered and I'm going to have to wait a while for it (big fan of instant gratification...) but this was an exception. Since purchasing it, I've seen a number of other bloggers who had the same mindset and even have friends that have decided they needed it in their closet too. The silky material makes it the perfect accessory since it is lightweight enough to not feel like too much of an extra layer. And when I need a jacket, this is the one I throw on. What clothing pieces do you plan to live in this season? I love your bucket list- looks like so much fun! 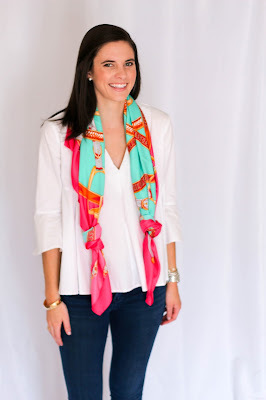 Also love your scarf and blouse! Gotta spend time for my closet, too. Love the white shirt.